Illegal Firearm Seized Saturday Mar 04. Glock 40. Basseterre, St. Kitts, March 06, 2017 (RSCNPF): Two illegal firearms were taken from our communities over the weekend. The first occurred early Saturday morning (March 04) when a Patrol of Defence Force Officers responding to a report of shooting in the Sandy Point area saw a person of interest sitting in the area. A search was conducted and revealed a .45 Ruger pistol with a magazine containing four (04) rounds of ammunition. The individual was apprehended and is in Police Custody. The second discovery and seizure was as a result of the execution of Search Warrant on Saturday (March 04) on a residence in Ottley’s Village. The officers discovered and seized a Glock 40 pistol. 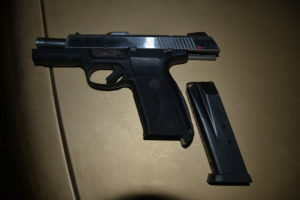 The pistol was found in the residence of one of the individuals in custody in relation to a drug seizure on the evening of Friday (March 03). These seizures brings to six(6) the number of illegal firearms removed from our communities so far in 2018.